I think the point at which we really grow up is when the idea of turning into one or both of our parents stops being terrifying and feels almost comfortable. However today, I thought I was skipping a generation and morphing into my grandmother Elizabeth. 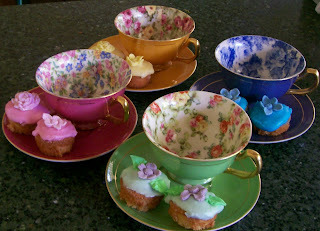 The thought hit me as I decided to use these colourful cups and saucers for afternoon tea today. It's not often that I use cups and saucers. When I was a teenager, Elizabeth used to buy me tea cups and saucer sets for birthdays. While I was polite, I always secretly wished it was something way more exciting like make-up or jewellery. It probably took me another 20 years or so to appreciate the humble tea cup and the whole notion of high teas. It all started when I had high tea at Raffles Hotel in Singapore. I decided I liked the decadent lifestyle and have introduced high teas on a regular basis since. My grandmother is no longer with us but her afternoon teas and their sense of occasion still have a place in my memory and in my life. I feel pretty comfortable with that! Great post. I found you on LR and I think your blog is very well-written and interesting. I'll definitely be back to enjoy more.